What Is Metabolic Testing for Weight Loss and Fitness? Have you considered investing in a metabolism test for weight loss or increased exercise performance? Metabolic testing is widely available at health clubs, universities, and some medical clinics, often for a substantial fee. Before you invest, it's important to understand how a metabolism test works and how the data is used to lose weight or improve your level of fitness. Metabolic tests measure the rate at which your body burns calories and uses oxygen during rest or during different activities. There are three tests that you may be offered when you look for metabolic testing. Not all test packages include all types of metabolic tests. Resting metabolic rate (RMR) test. Almost all metabolic testing involves first measuring resting metabolic rate (RMR) This test provides an estimate of the number of calories you burn when your body is at complete rest. VO2 max test. Some metabolic test packages also involve testing your metabolic rate during different stages of exercise—also called an aerobic capacity test or a VO2 max (maximum volume of oxygen) test. The exercise test gives you information about the intensity levels at which your body uses oxygen (and burns fat) more or less efficiently. Lactate threshold test. Used primarily for athletes, this test provides data about the intensity level where your body can no longer supply enough oxygen for maximum performance. This the point when lactate production peaks and fatigue sets in. In most cases, the numbers from your test(s) are assembled into a personalized exercise or weight loss program tailored to improve your specific metabolic profile and to help you to lose weight or improve athletic performance. Metabolic testing used to be available only in expensive laboratory or hospital settings. Several years ago, health clubs and gyms started offering metabolic assessments using more cost-efficient equipment. The test equipment and procedures that are used in a health club setting are often similar to but aren’t necessarily identical to the equipment and protocols used in a lab setting. An RMR or resting metabolic rate test is fairly straightforward. If you are the type of person who gets nervous when their performance is evaluated, this is definitely not a test you need to worry about. But it can be helpful to understand the different types of resting metabolic rate tests. The most expensive but highly regarded test is the direct calorimetry test. A direct calorimeter is a large insulated, air-tight chamber. During a test you spend at least an hour inside the chamber with minimal movement. During that time your released body heat (including expired carbon dioxide and vapors) is measured. Based on these measurements, a resting metabolic rate is calculated. In most situations, this test is not practical due to the expensive equipment needed and the time you need to spend laying in the chamber. Indirect calorimetry is a more practical and widely used protocol. There are many different devices (handheld and otherwise), but none of them involve the substantial equipment or time investment that direct calorimetry requires. Indirect calorimetry measures the volume of oxygen that you consume compared to the volume of carbon dioxide that you expire while your body is at rest. Based on the numbers, a formula is used to calculate the number of calories you burn when your body is at rest. If you invest in metabolic testing near you, you will almost certainly have an indirect calorimetry test performed. The protocol is simple. Before the test, you should avoid eating or exercising for at least 3-4 hours. Many people have the tests performed first thing in the morning. You should also avoid caffeine or any other stimulant. When you arrive at the testing facility, you'll be allowed to rest quietly for a short period of time. Then you'll sit or lay in a relaxed position and a mask or mouthpiece will be given to you to breathe into. You'll continue to rest while breathing into the mouthpiece for 10-20 minutes. During this time the amount of carbon dioxide that you exhale is measured. After the test is complete, your trainer or physiologist will calculate the number of calories that you burn while at rest. 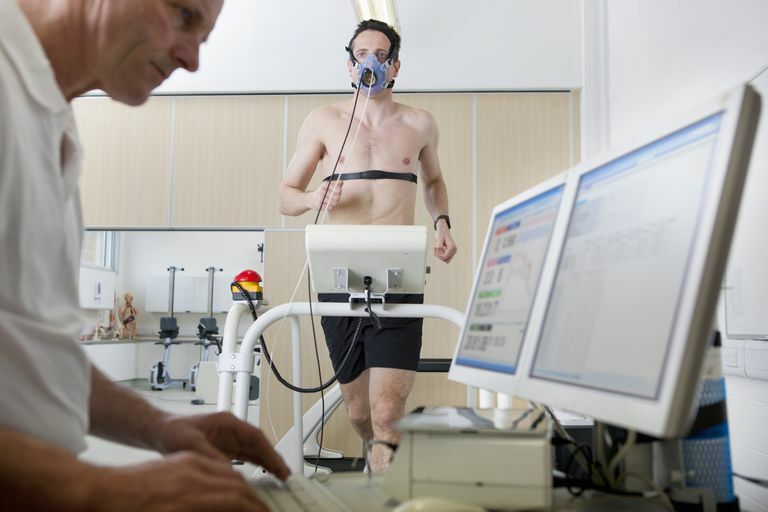 If you undergo aerobic capacity (VO2 max) testing or lactate threshold testing, there are different ways that the test might be performed based on your background and activity experience. For example, if you are a performance cyclist, then your exercise testing may be performed on a bike. For the general population, many exercise tests are performed on a treadmill. You breathe into a mask similar to the one used for your RMR test while walking on the treadmill. During the test, both the incline and the speed of the treadmill are increased at measured intervals. The test continues until you can no longer tolerate the intensity or until the physiologist ends the protocol. Based on the amount of carbon dioxide that you exhale during each stage of exercise, the trainer can estimate how efficiently you use oxygen/burn calories at each intensity. Based on your resting metabolic rate and your estimated daily activity, your trainer can estimate the total number of calories you burn every day without exercise. You’ll also learn how your body burns fuel during exercise. These numbers can help you to manage your food intake during the day and can help you to make smart choices about different types of exercise. For example, if you learn that it takes you three hours of sedentary activity to burn off the calories in your favorite treat, you might think twice about eating that treat. And if you learn that it takes an hour on the treadmill to burn off your favorite sweetened beverage, you might become inspired to drink water instead. Not everyone should undergo metabolic testing. Whether or not you will benefit from a test depends on a number of factors, says Tim Coyle, M.S., an integrative physiologist at Complete Wellness, located in New York City. He says that sometimes the tests are helpful and other times they do more harm than good. He explains that metabolic numbers are only helpful if they are presented in the context of a comprehensive program. He also says that not all tests are helpful for all clients. "Most people I have worked with don't benefit from VO2 max testing," he says, explaining that the test can be discouraging if a client thinks they are in better shape than they are. "I don't like delivering discouraging news, so I only do VO2 max if either someone is completely lost, very stubborn and apparently unfit (to give them objective data), or very fit and wants to know their numbers." On the other hand, he says that resting metabolic rate tests can be helpful for a wide range of clients. "People have a hard time understanding their metabolism." He explains that providing some specific numbers can help to balance out the confusion and provide meaning. Additionally, research studies have also shown that calorie numbers provided by popular activity trackers may not be accurate. Another benefit is that Coyle says the tests can help to boost commitment if the numbers are presented in a way that is understandable. "When people are confident that what they are doing will work, they tend to be more committed, therefore having more success. So much of this fitness game is mental. Having more data can either confuse if not communicated properly, or it can give confidence!" However, there are other downsides that need to be considered. These tests can be pricey—a single session can be $75-$100 or much more depending on your location. And just having the numbers won't do the hard work of diet and exercise for you. They are not a magic bullet for weight loss or improved fitness. For example, if you weren’t a regular exerciser before having this test, then you probably won’t be after you have it done. In that case, the test results don’t really matter. The VO2 max test is a good test for people who exercise on a regular basis. But for people who don’t, it might not be the best initial investment. Lastly, some critics feel that metabolic testing in health club settings is not accurate enough to be effective. The type of equipment used, the experience of the tester and your own ability to follow testing protocols will all impact the accuracy of the results that you get. Coyle recommends finding a qualified clinic or exercise physiologist for the best experience. He says the equipment matters—there are good ones and there are cheap ones—but the investment should be in a qualified tester. "Precision matters in this testing, but again, I'll say the most important thing is the consult itself. The interpretation and the lens through which the tester is looking when giving the guidance." If you’re a regular exerciser and your workouts don’t seem to give you the results that you need, then exercise testing might be right for you. Or if you've been dieting and tracking your food intake to no avail then metabolic testing might be a smart next step. The personalized test results may provide you with the adjustments you need to change your body composition and reach your goals. But before you invest hundreds of dollars on the procedure, get detailed information about the facility and the tester. Ask questions about the test taker's experience and credentials. You may also want to know how often the testing equipment is calibrated and if the facility updates equipment on a regular basis. It may be worth your money to go to a medical center or university and work with an exercise physiologist even if it is slightly more expensive. Lastly, keep in mind that exercise testing is not "one and done." As your body changes, your numbers will change. Coyle recommends retesting at 12 weeks to six months, depending on your goals.